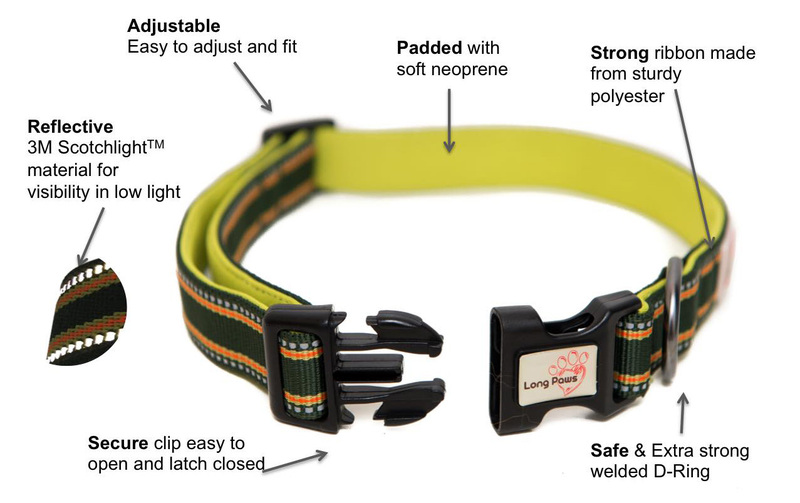 ​This green comfort collection dog collar is not just another dog collar. The collar is easy to adjust and once sized holds its position well. The padding is beneficial for boisterous puppies, intensive pullers, and even lighthearted walkers. If your dog is an active walker or even a heavy puller, the shock absorbent padding ensures dogs won't get stressed or irritated, even if they pull heavily on the lead. The Comfort Collar is an ideal first collar for puppies, as the padding helps ensure their sensitive skin doesn’t easily chafe. The collar is brightly set with two high quality 3M Scotchlite reflective strips ensuring your dog is visible to cars, even in the dark. The clip goes on easily and securely, and the D-ring has been welded together for added strength, making certain that even the strongest of pullers cannot do any damage. The Comfort Collar is also machine washable, so your dog can get as messy as he / she wants, and your washing machine can sort out the mess. In short the Comfort Collar is ideal for dogs of all ages, and is the perfect outdoor accessory for adventurous dogs. The collars are available in 5 adjustable sizes. If you need to return or exchange an item please email us at returns@chelseadogs.com within 14 days of receiving your item stating your full name and contact details and your reason for return.